My winter/holiday decorations are slowing going up this week! First order of business was to take down my fall wreath and replace it with a winter wreath! 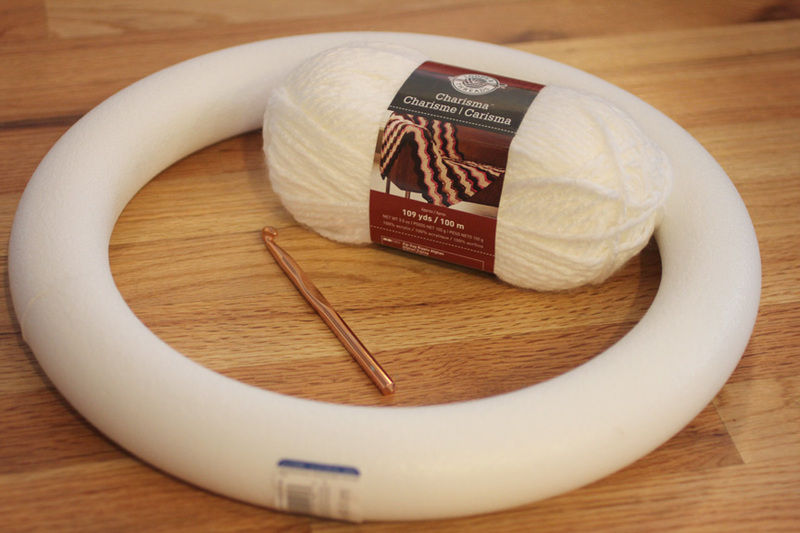 I wanted to make another crocheted wreath and knew that the soft Loops & Threads yarn that I used for my crochet snowman hat would be perfect for my winter wonderland. I used a 16 inch white styrofoam wreath, Loops & Threads Charisma yarn in white, and a size N crochet hook. 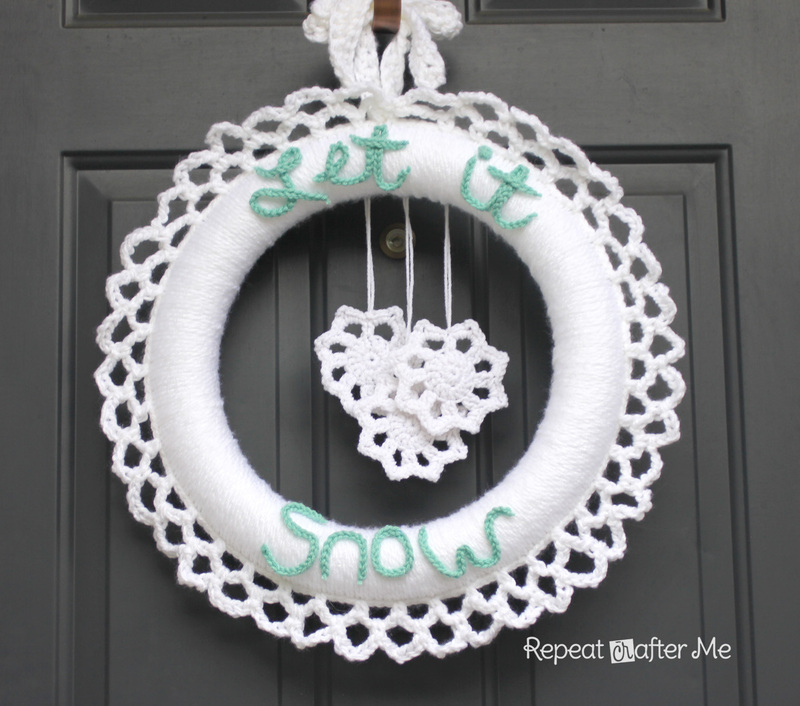 I found a wonderful tutorial on how to crochet around a styrofoam wreath by Lisa at Good Knits. She provides step-by-step instructions with pictures that are easy to follow. I am very pleased with the result and it took less than hour to make! You can find the tutorial HERE. 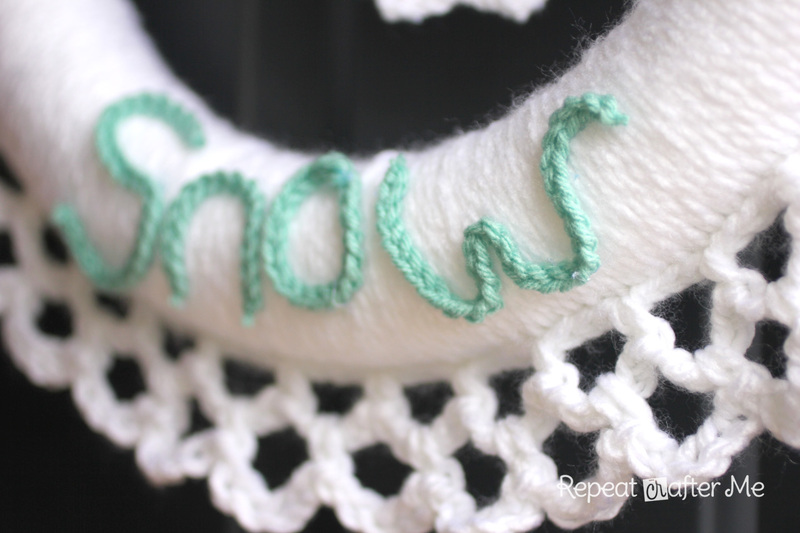 To make the “Let it Snow” writing, I made multiple crocheted chains and cheated by using my hot glue gun to glue the chains on to form the letters. Sometimes you gotta take some short cuts to make things look the way you want 🙂 I used Caron Simply Soft One Pound Yarn in Soft Sage. I hung 3 crocheted snowflakes in the center of the wreath. 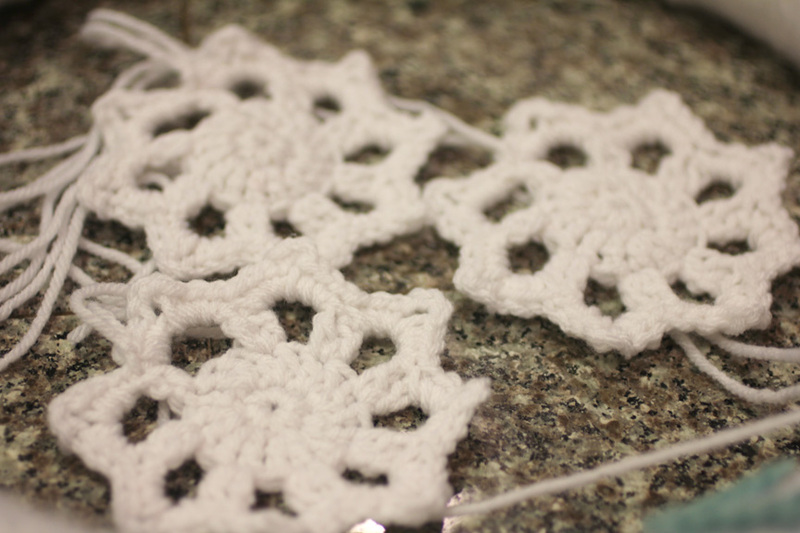 The snowflakes are a very easy pattern by the talented Kadie at Seven Alive. I used Loops and Threads Impecabble yarn in white and a size F hook (because that is all I could find in my bedside table drawer). You can find the snowflake pattern HERE. I left a long tail at the end of the pattern and tied it to a strand of yarn on the back of the wreath. I hope everyone is feeling the holiday spirit! I love this time of year 🙂 Happy Holidays! Sarah – that is beautiful! You make it look so easy! Great job! I love your style and creative ideas!! 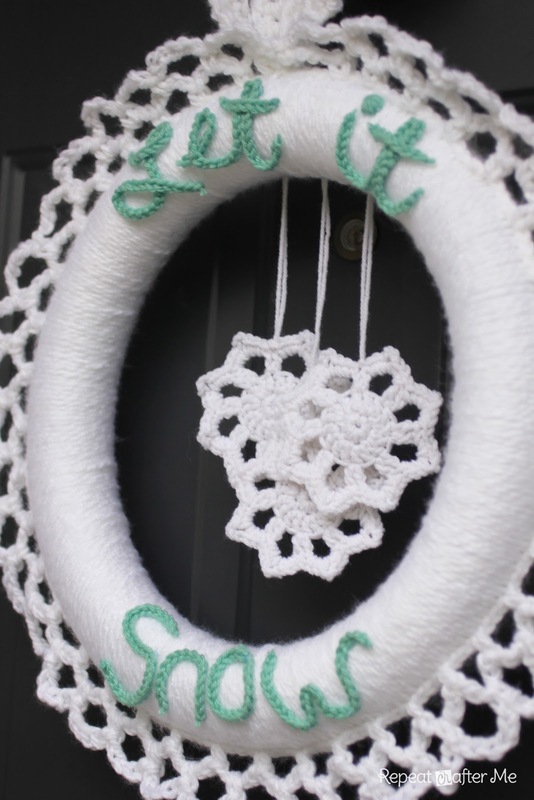 I have been looking for a crochet wreath pattern/idea and I LOVE this one, so thank you for sharing 🙂 I enjoy following your blog. Merry Christmas! What a cute wreath! I love the idea of using chains for the letters. What an awesome wreath!! Thanks for sharing! Sarah, I LOVE this wreath, how BEAUTIFUL. I love this, Sarah! It is so beautiful. You really have a great eye for crochet design. Thanks for sharing at Hookin On Hump Day! I love this wreath and have made it.., but wonder if you stiffened the loops around the outside. Mine seem to flop around a lot. 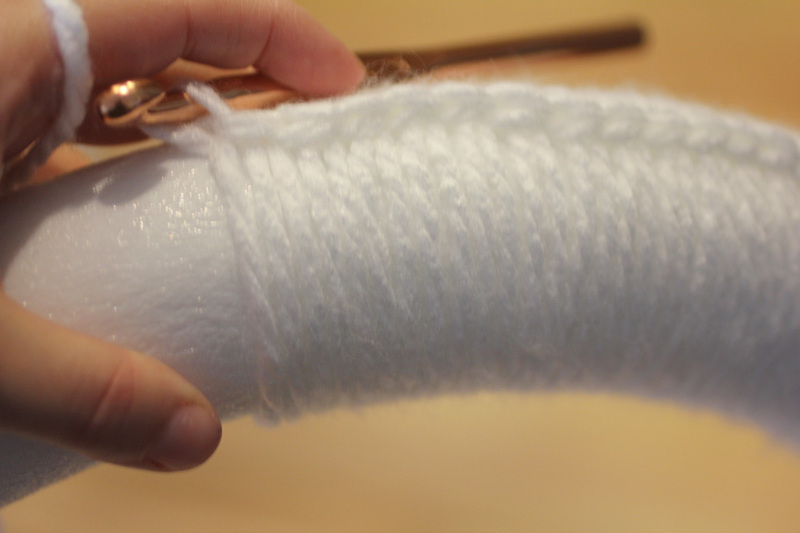 I used #5 Bulky yarn. Love your wreath projects, just finished the fall one, but I want to know where your able to buy round 16in foam wreaths? For the fall one I did, all I could find was the 16 in foam wreaths that had edges if that makes sense instead of the smooth rounded ones. I went to JoAnnes and Micheal's and they have the smooth rounded ones but only up to size 14in, after that they have edges. 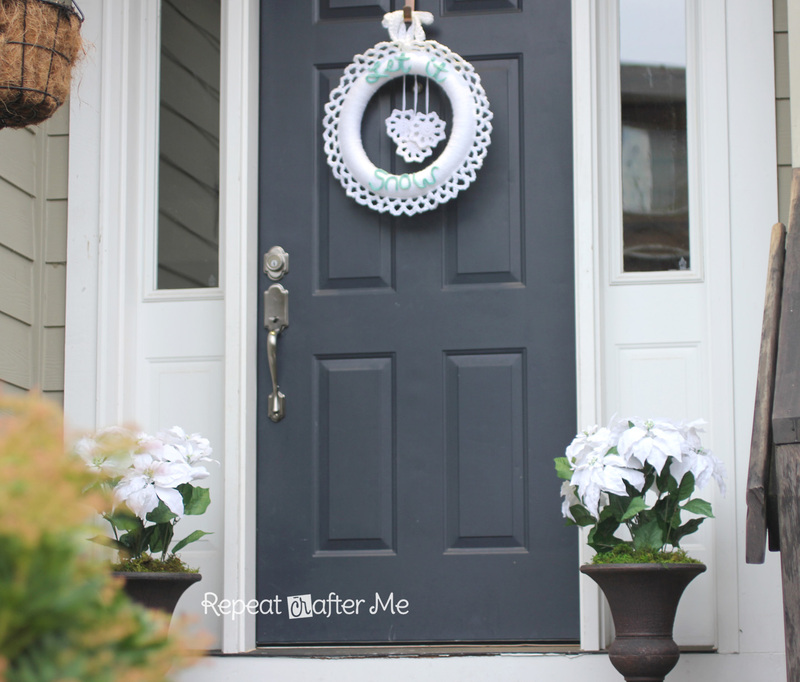 Simply beautiful, your crochet wreath for winter. That’s what we’ve all been waiting for! Great pogstni! It seems like a lot of the links no longer work. I’m trying to get the snowflake pattern and end up at a privacy screen page. Same for one of the links to how you wrap the wreath. how do I get the pattern for this wreath?